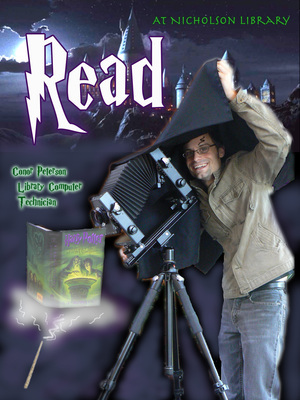 Conor Peterson, Library Computer Technician, reading Harry Potter and the Half-Blood Prince, by J.K. Rowling. Terry, Paula and Nicholson Library Staff, "Conor Peterson READ Poster" (2009). READ Poster Gallery. Image. Submission 50.